Professor Golnaraghi studied Mechanical Engineering at the Worcester Polytechnic Institute in Massachusetts, where he received both his Bachelor and Master of Applied Science in 1982. He then received his PhD in 1988 from Cornell University in Theoretical and Applied Mechanics – specializing in nonlinear dynamics and control systems. 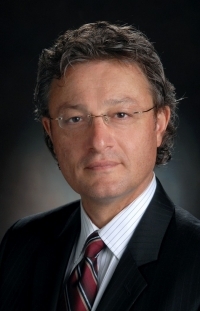 In 1988, Dr. Golnaraghi became a professor of Mechanical Engineering, and later Mechanical and Mechatronics Engineering, at the University of Waterloo. He also was awarded the prestigious Tier I Canada Research Chair in Mechatronics and Smart Material Systems at Waterloo in 2002. Professor Golnaraghi joined SFU in August of 2006 as the Director of Mechatronic Systems Engineering Program – the flagship program at SFU Surrey. Surrey is SFU’s new campus with a variety of unique programs inspired by ever-evolving technology, and the ever-changing global marketplace, and Mechatronics program has become the centerpiece of these activities. This program is now one of the top Mechatronics Engineering degree programs in North America, and in high demand – with an average of 100 new undergraduate and 25 new graduate student admissions yearly. In 2012, the program enjoys 486 undergrad and 100 grad students. As of April 2013, the program will become an autonomous department within the Faculty of Applied Science – School of Mechatronic Engineering. Dr. Golnaraghi also holds a Burnaby Mountain endowed Chair at SFU, and continues to be very active in various research projects. Since 1988, he has graduated more than sixty Masters and PhD students. His pioneering research has resulted in three textbooks, more than two hundred journal and Conference papers, four patents and three startup companies. See research activities section for more detail.